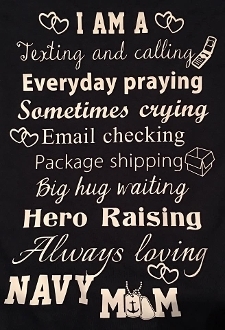 Vinyl printed Tee Shirts for Navy Moms. Available in Navy Blue or Red preshrunk cotton with White letters. it has a large design that is approximately 7X11 inches. I normally keep this shirt in stock and it is usually available for quicker shipping than the embroidered shirts. These shirts are co-ed/unisex sized so keep that in mind when choosing the best size for you.